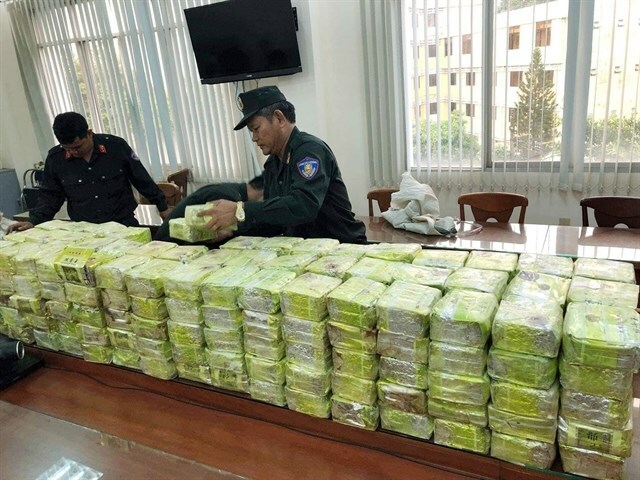 HCM City (VNS/VNA) - Several recent large drug seizures in Ho Chi Minh City have raised concerns over the extent of drug crimes in the southern economic hub, and the local administration is fighting back. In addition, thanks to widespread media coverage, abnormal behaviour after meth use is no longer a rarely seen phenomenon. On March 11, 26-year-old Nguyen Hoang Nam in HCM City went on a violent killing spree that claimed the lives of both his parents, his grandmother and his girlfriend’s grandmother, reportedly fueled by the girlfriend’s family’s disapproval of his criminal record and meth. Meth use by long-distance drivers also recently came to the forefront of public consciousness after a drugged driver ploughed through a crowd of people at a traffic intersection in Da Lat in March, luckily, there was no casualty, but the same could not be said about an accident in January that killed eight in Hai Duong province, also by a driver on meth. Given HCM City has the largest number of drug addicts in the country -- approximately 23,000 registered, making up 10 percent of the country’s figure -- there's public demand for law enforcement agencies to handle these incidents. Dr Huynh Thanh Hien from the HCM City Mental Health Hospital said the highs users get from crystal meth frequently involve delusions and aggression. Long-term abuse can alter the user’s personality, as well as damage the body and cognitive functions. Hien also cautioned against a common misconception among the community that crystal meth is not as addictive as heroin or can be used to relieve dependence from the opium, which often leads to double addictions. According to law enforcement agencies, drug trafficking has become a complicated matter as aside from traditional delivery methods, the ease of making purchases of these illegal substances online via social media have contributed to the rise of drug uses, thwarting authorities' attempts to curb addiction. In 2018, the city discovered nearly 1,400 drug-related cases involving nearly 3,000 individuals. About 2,500 were charged with trafficking and possession, up by 15 per cent compared to last year, with the amount of meth seized up 75 per cent (512kg in total). Characterising drugs as “the mother of all crimes,” Minister of Public Security To Lam said attempts to reduce crimes would be for naught if drug crimes were not contained. Intensified crackdowns have uprooted drug rings in northern mountainous areas, forcing criminals to move southward, elevating the risks of turning HCM City into both a ‘terminal’ to move drugs originating in the Golden Triangle area to other countries, and a consumer market. Nguyen Huu Nghiep, deputy head of the city’s customs department, said traffickers have taken advantage of the city’s policies aiming at easing customs procedures, especially automatic electronic declarations, to sneak drugs in and out of the country – usually by inserting drugs into the sleeves or linings of goods’ packages like CDs holders, computers’ hard disk drives, or vacuum cleaners. The traffickers also use fake ID cards to deposit goods or hire an agency to declare the goods at customs to avoid the drugs being traced back to them. HCM City Customs in recent times has made large-scale drug seizures from the US, Canada and some European countries that were brought to Vietnam via airways, post or express delivery services, Nghiep said, adding that from the beginning of 2018, the customs department also took notice of the rise in the trafficking of MDMA, or ecstasy. In the recent bust of the largest amount of drugs ever in the country, which involved a ring that transported nearly 1 tonne of drugs over the span of nearly two years, HCM City authorities discovered another ruse that traffickers have been utilising: hiding drug packs in sacks of plastic beads meant to be exported to other countries, which mean they will not have to pass usual scanning at customs. Aside from crackdowns on trans-provincial and trans-national drug rings, local authorities are also working to curb demand from the city's drug addicts. The department also warned that drug addicts in the city are getting younger and are more likely to be dependent on multiple types of drugs at the same time. Le Dong Phong, director of the city’s police department, said a preliminary survey of addicts in the city showed 80-90 percent of them tested positive to drugs not on the authorities’ list of banned substances, necessitating a survey of addicts for appropriate preventive measures. The municipal People’s Committee said it had supported grassroots drug rehab centres’ efforts to help addicts end drug dependence and provide psychological counselling to help them re-integrate them into the community and prevent relapses.